Ole Miss has one former player in the National Quarterback Club Hall of Fame. ^ "Ole Miss Athletics: Rebels Find New Leader in Houston Nutt". ^ "Ole Miss Athletics: Houston Nutt Introductory Press Conference". ^ "Ole Miss football 2007 Media guide". The 1893 Ole Miss Rebels football team represented the University of Mississippi during the 1893 college football season. The 1908 Ole Miss Rebels football team represented the University of Mississippi during the 1908 college football season. Commenting on the game between Vanderbilt and Ole Miss which he officiated, Grantland Rice called captain Ike Knox, "a sensation in light hair, broad shoulders and stocky frame that gave both the Commodore offense and defense a shock that will not soon be forgotten." Rice continued: "Time and again, as a Commodore back would start down the field, the gorilla-like arms of the demon Knox would encircle his frame and said runner wasn’t only checked, but more often still, literally hurled yards towards his own goal line." In another article Rice wrote that only the mediocrity of his team kept Knox from being regionally and nationally famous: "If Knox has been upon a Vanderbilt, Sewanee or Auburn eleven he would more than likely have been hailed as one of the greatest halfbacks of the decade." The 1915 Ole Miss Rebels football team represented the University of Mississippi during the 1915 college football season. The season was the first under former Vanderbilt athlete Fred A. Robins. The 1917 Ole Miss Rebels football team represented the University of Mississippi during the 1917 college football season. The season was the first under head coach Dudy Noble. The season closed with the team's only victory, over Mississippi College. The 1921 Ole Miss Rebels football team represented the University of Mississippi during the 1921 college football season. The 1939 Ole Miss Rebels football team represented the University of Mississippi in the 1939 college football season. The Rebels were led by second-year head coach Harry Mehre and played their home games at Hemingway Stadium in Oxford, Mississippi. After winning their first three games of the season, Ole Miss made their first ever appearance in the AP Poll. Their victory over rival Vanderbilt was also their first ever; they had lost the first 19 match-ups in the series over a 45-year span. They would finish with a record of 7–2 (2–2 SEC), to finish fifth in the Southeastern Conference. The 1941 Ole Miss Rebels football team represented the University of Mississippi in the 1941 college football season. The Rebels were led by fourth-year head coach Harry Mehre and played their home games at Hemingway Stadium in Oxford, Mississippi. They finished with a record of 6–2–1 (2–1–1 SEC), to finish fifth in the Southeastern Conference. Ole Miss was ranked in the final AP Poll for the first time in school history, ranked 17th. The 1950 Ole Miss Rebels football team represented the University of Mississippi during the 1950 college football season. The 1951 Ole Miss Rebels football team represented the University of Mississippi during the 1951 college football season. The 1957 Ole Miss Rebels football team represented the University of Mississippi during the 1957 NCAA University Division football season. The Rebels were led by 11th-year head coach Johnny Vaught and played their home games at Hemingway Stadium in Oxford, Mississippi (and alternate site home games in Jackson, Mississippi). They competed as members of the Southeastern Conference, finishing in second with a regular season record of 8–1–1 (4–0–1 SEC), and were ranked 7th in the final AP Poll. They were invited to the 1958 Sugar Bowl, where they defeated Texas, 39–7. The 1959 Ole Miss Rebels football team represented the University of Mississippi during the 1959 NCAA University Division football season. Ole Miss finished the season with an overall record of ten wins and one loss (10–1), tied for second in the Southeastern Conference (SEC) and with a victory over LSU in the Sugar Bowl. The team gave up only 21 points all season, and were crowned national champions by Berryman, Billingsley, Dunkel and Sagarin. Syracuse was crowned as the national champion by both the AP and the UPI wire services. The team was later rated the third best squad from 1956–1995 by Sagarin. The 1961 Ole Miss Rebels football team represented the University of Mississippi during the 1961 NCAA University Division football season. The Rebels' finished the season with a 9–2 record and received a berth in the Cotton Bowl, where they lost to the Texas Longhorns, 12–7, after winning two consecutive national championships. The 1977 Ole Miss Rebels football team represented the University of Mississippi (Ole Miss) in the 1977 NCAA Division I football season as a member of the Southeastern Conference (SEC). The team was led by head coach Ken Cooper, in his fourth year, and played their home games at Hemingway Stadium in Oxford, the Mississippi Memorial Stadium in Jackson, Mississippi and Liberty Bowl Memorial Stadium in Memphis, Tennessee. They finished the season with a record of five wins and six losses (5–6 overall, 2–5 in the SEC). In 1978 their record was updated to six wins and five losses (6–5 overall, 3–4 in the SEC) after Mississippi State was forced by the NCAA to forfeit their win over the Rebels for playing an ineligible player. The 1979 Ole Miss Rebels football team represented the University of Mississippi during the 1979 NCAA Division I-A football season. The 1989 Ole Miss Rebels football team represented the University of Mississippi during the 1989 NCAA Division I-A football season. 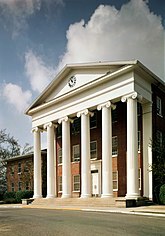 The 2002 Ole Miss Rebels football team represented the University of Mississippi during the 2002 NCAA Division I-A football season. The team participated as members of the Southeastern Conference in the West Division. Coached by David Cutcliffe, the Rebels played their home games at Vaught–Hemingway Stadium in Oxford, Mississippi. The 2003 Ole Miss Rebels football team represented the University of Mississippi during the 2003 NCAA Division I-A football season. Coached by David Cutcliffe, the Rebels played their home games at Vaught–Hemingway Stadium. The 2004 Ole Miss Rebels football team represented the University of Mississippi during the 2004 NCAA Division I-A football season. They participated in the Southeastern Conference in the Western Division. The team played their home games at Vaught–Hemingway Stadium in Oxford, Mississippi. They were coached by head coach David Cutcliffe. The 2007 Ole Miss Rebels football team represented the University of Mississippi during the 2007 NCAA Division I FBS football season. This was Ed Orgeron's third and final season as head coach of the football team.